It forms part of the convent of Jesús y María of the Franciscan order. It is dedicated to St. Francis of Assisi. The Basilica was designed in a Neoclassic style in the second half of the 18th century, based on a design by Francisco Cabezas, developed by Antonio Pló, and completed by Francesco Sabatini. The Basilica has a round floor plan and boasts the largest dome in Spain, at 108 feet in diameter - even larger than that of St. Paul's Cathedral in London. 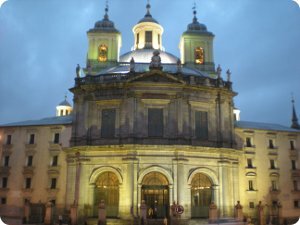 The church contains paintings by Zurbarán and incorporates three chapels, including the Chapel of San Bernardino de Siena with a magnificent painting of the saint by Francisco Goya. The figure on the right in the painting that is not looking up is a self-portrait of the artist. The seven main doors were carved of American walnut by Casa Juan Guas and the 16th-century Gothic choir stalls are from La Cartuja del Paular, in Segovia province. The temple once functioned as the National pantheon, and enshrined the remains of famous artists and politicians. Tuesday to Friday: 11:00 to 12:30 and 16:00 to 18:30. * Line 5 - La Latina or Puerta de Toledo stations.